As one of the greatest musical moments in television history, Elvis' comeback was not just entertainment, it was the kick-start for the revitalization of a career. And, behind it all was influential director and producer Steve Binder. 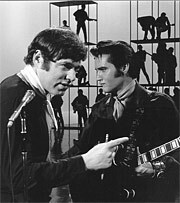 In 1968, Binder directed and produced the NBC television event; "Elvis" (now commonly referred to as the "'68 Comeback Special"). In celebration of what would have been Elvis' 76th birthday, Binder will share his memories about the making of the special, share clips from the program and discuss what it was like to work with "the King." Additionally, he'll also discuss his work on the T.A.M.I Show and the now historical Diana Ross in Central Park. A post–discussion question and answer session will immediately follow and Binder will sign copies of Elvis: '68 at 40: Retrospective, just released in paperback.